Sibling rivalry: Alexander Zverev beats brother Mischa in D.C. UPDATED: Thu., Aug. 2, 2018, 9:51 p.m.
Alex de Minaur, Australia, def. Steve Johnson (11), United States, 6-4, 7-5. Andrey Rublev (16), Russia, def. Tommy Paul, United States, 7-6 (5), 6-4. Noah Rubin, United States, def. John Isner (2), United States, 6-4, 7-6 (6). David Goffin (3), Belgium, def. Frances Tiafoe (13), United States, 6-0, 6-3. Stefanos Tsitspas (10), Greece, def. James Duckworth, Australia, 6-3, 6-4. Alexander Zverev (1), Germany, def. Mischa Zverev (15), Germany, 6-3, 7-5. Kei Nishikori (7), Japan, def. Denis Shapovalov (9), Canada, 7-6 (1), 6-3. Andrey Rublev (16), Russia, def. Noah Rubin, United States, 6-3, 6-2. Belinda Bencic (6), Switzerland, def. Nao Hibino, Japan, walkover. Donna Vekic (7), Croatia, def. Fanny Stollar, Hungary, 6-2, 3-6, 7-6 (13). Zheng Saisai, China, def. Ysaline Bonaventure, Belgium, 6-4, 6-4. Allie Kiick, United States, def. Katie Boulter, Britain, 6-4, 5-7, 6-1. Yulia Putintseva (8), Kazakhstan, def. Jennifer Brady, United States, 7-5, 6-2. Magda Linette, Poland, def. Naomi Osaka (3), Japan, 6-2, 3-6, 6-3. Svetlana Kuznetsova, Russia, def. Ana Bogdan, Romania, 6-2, 6-1. Alexander and Mischa Zverev, Germany, def. Oilver Marach, Austria, and Mate Pavic (1), Croatia, 6-1, 6-4. Ysaline Bonaventure, Belgium, and Fanny Stollar, Hungary, def. Chan Hao-ching, Taiwan, and Yang Zhaoxuan (1), China, 7-5, 4-6, 10-3. Alexa Guarachi, Chile, and Erin Routliffe (4), New Zealand, def. Louisa Chirico and Allie Kiick, United States, walkover. 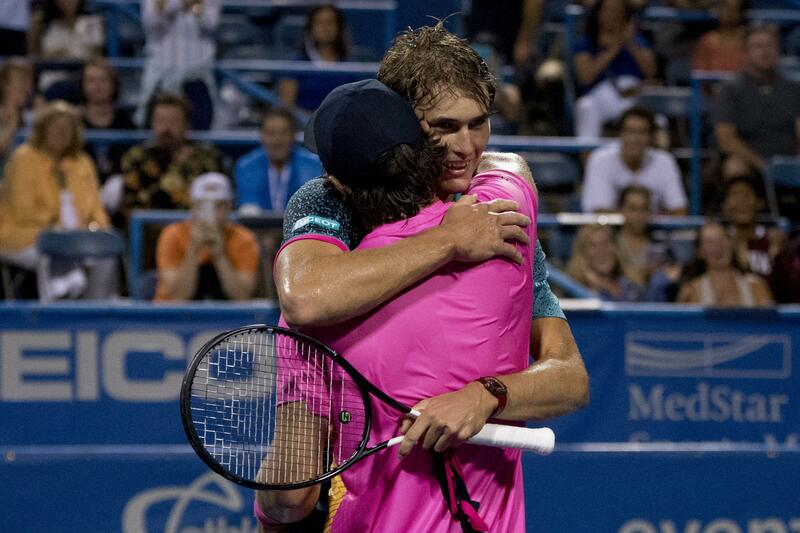 WASHINGTON – For brothers Alexander and Mischa Zverev, this was, in many ways, just like many another day on the professional tennis tour: They warmed up together at a tournament. “I just enjoyed it out there,” Alexander said. In Friday’s quarterfinals, he’ll play No. 7 Kei Nishikori, who defeated No. 9 Denis Shapovalov 7-6 (1), 6-3, and No. 3 David Goffin faces No. 10 Stefanos Tsitsipas. No. 2 John Isner was eliminated 6-4, 7-6 (6) in the second round by Noah Rubin, who then had to go out and play another match, which he lost to No. 16 Andrey Rublev. The dynamics were a bit different from a usual match. The Zverevs know each other’s on-court strengths and weaknesses so well. There wasn’t much emotion from either. And not much cheering from spectators, who maybe had a hard time picking which one to pull for. Instead of using simply a last name to refer to a player, the normal practice, the chair umpire used first names, too. As in: “Game, Sascha Zverev,” using Alexander’s nickname. Published: Aug. 2, 2018, 4:53 p.m. Updated: Aug. 2, 2018, 9:51 p.m.